At the Scene of the Crime: It Feels So Good to Be Bad! Anyone who reads my blog regularly has, by now, noticed two things about me. First off, I’m positively insane. Second, whenever I get introduced to a new author and am very impressed with the book in question, I tend to go on a reading binge. I did this earlier in 2012 with Donald E. Westlake, devouring Dortmunder and Parker novels as though they were potato chips until I realized that I would soon run out of my supplies if I kept at it. 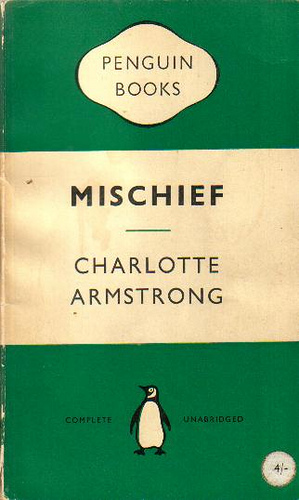 But I just can’t learn my lesson, and I’m at serious risk of doing it again with the work of Charlotte Armstrong. 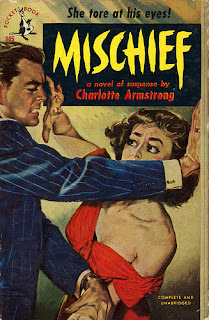 The symptoms are all there, and I just got finished reading Armstrong’s novel Mischief. Mischief was originally published in 1950, but happily, it’s been brought back into digital print by The Mysterious Press, along with several of Armstrong’s novels. I can’t begin telling you how glad I am about this. 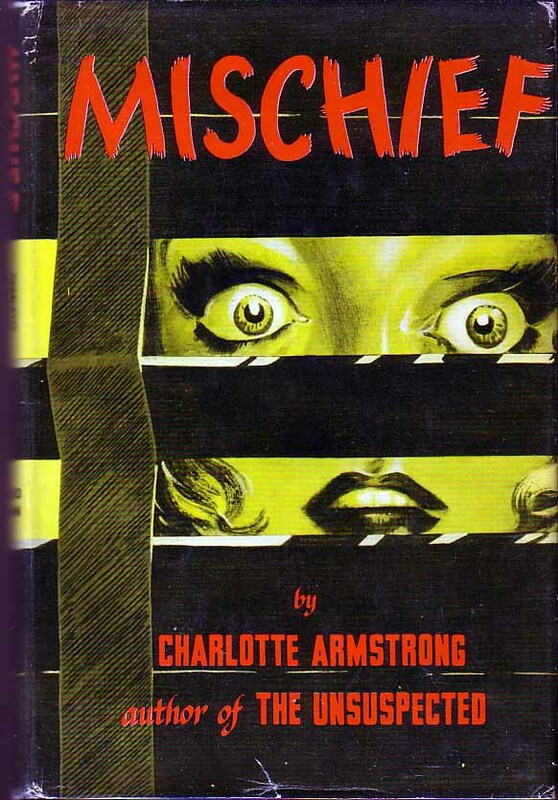 Charlotte Armstrong was a supremely talented writer, capable of conjuring suspense out of thin air, creating memorable characters and perilous situations. I was aware that I was reading a work of fiction, but I felt a deep emotional investment in the entire story, and was on the edge of my seat throughout the book. It’s a short read, and that’s in its favour: the story unravels quickly and neatly. But at the same time, Armstrong creates some truly memorable characters. I particularly liked the character of Jed Towers. He’s about to fly out of town to take up a new, important job, and so was spending potentially his last evening with Lyn Lesley. The date had an air of decisiveness around it: this would either make or break their relationship. Unfortunately, things get off to a bad start: when they are accosted by a beggar in the street, Jed walks away and drags Lyn along with him. This upsets Lyn, and they argue about just how much you can really trust other people. Jed argues that the beggar was probably quite comfortably off and didn’t need the money, while Lyn says that even if that were the case, she’d at least have felt better had Jed given the man some money. With a huff, the two separate, and Jed goes back to his hotel room… where, from his window, he looks into Room 807 and spies Nell Munro. He decides that, what the hell, he might as well flirt with her, and so he inadvertently gets sucked into a deadly game played between the insane Nell and the rest of the world. It’s through Jed that Charlotte Armstrong weaves not only an intricate plot, but also fascinating themes through which she explores the human condition. Jed begins the evening as the cynical man-of-the-world, scoffing at Lyn’s naiveté, but he himself is lured into a trap. He soon realizes that Nell is insane and must figure out a way of escaping her clutches without exposing little Bunny to the dangers of being left alone with this madwoman. But nothing quite works out, and everything slowly leads to a tense climax, where miscommunications, misunderstandings, and delays all add up to create a memorable conclusion to the novel. As much as I’d like to say more (both on the plot and the thematic levels), that would necessitate spoiling the ending… so instead, I recommend reading the book for yourself. When Mischief was originally published, Anthony Boucher’s review for The New York Times stated that “Miss Armstrong is amazingly adroit at fusing action with character development, and at utilizing the most theatrical devices not only to thrill but to say something about Man and his world.” I can think of no better way to describe Charlotte Armstrong’s talent as a writer. Mischief is an extraordinary achievement, a short but sweet book full of tension. It’s one of those books that you must read for yourself to fully appreciate it. 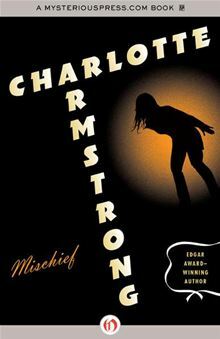 I, for one, highly recommend it, and can only scratch my head in amazement that Charlotte Armstrong could have fallen into obscurity. Note: This book was made into a film, Don’t Bother to Knock, starring none other than Marilyn Monroe as Nell! I have not seen the movie but am interested in the idea. Monroe never entered my mind as a possible actress to portray Nell, but the idea of her playing an insane babysitter is too delightful for words. I might review the film here in the future. For more on how you can get Mischief as an e-book, visit this link from The Mysterious Press. 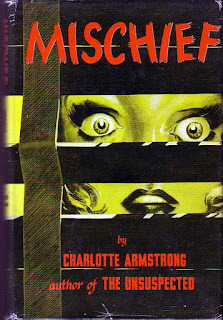 I have this one in 'The Charlotte Armstrong Treasury.' In the preface, Alice Cromie wrote:"'Mischief', in 1950, which began as a play, aptly titled 'Little Nell', and became a movie starring Marilyn Monroe, 'Don't Bother to Knock', must have improved the quality of baby-sitters, if not hotel detection or easy romancers, giving parents pause to think before they selected." I am pleased that The Mysterious Press has seen fit to reissue Armstrong's works. I found a nice copy of 'The Gift Shop' at a library sale for 50 cents. But many of her titles don't even show up in used bookstores! I find her books in used bookstores all the time, Jim. You need to come to Chicago. I think I need to come to Chicago as well to see such a treasure trove for myself! A trip to Chicago might fit in with my summer schedule... there's something about trolling some dusty old shelves for the next big find, which a hunt online simply can't provide.